Conceptual artist Rebecca Weisman inserts herself into the landscape of her art in My Human Being, which is currently on exhibit at the Julian Scott Gallery, Johnson State College, in Vermont until March 10th. With 3 simple words, My Human Being, Weisman investigates our changing environment and how one tries to both capture and let go of time and one’s own placement within it. This multi-media installation engages viewers with film imagery that have been 5 years in the making. The installation encompasses a 5 channel surround sound score that includes white noise, recorded speech and the sound of water dripping onto a microphone. The sounds include a wide range from natural to artificial. Gallery director Leila Bandar finds that “there is a visceral quality to the sound element — a drip, drip, drip, the repetitive clacking, the whale-song sound of syllables stretched”. Bandar asks “What do we see when we hear a drip?”. Time is a central element that Weisman records, observes, engages with and disrupts with the construction and dissolving of her inscription, My Human Being, made by using the landscapes available raw materials, her body and shovels. Inside the gallery space a fast motion loop filmed in the spring, summer and fall shows the artist creating, on nature’s canvas, that which can not be preserved. Through these seasons the inscription’s transformations are many, as the letterforms dance with the environmental forces that move upon, around and eventually through them. The installation also includes an outdoor component of My Human Being in winter that, at night, is projected onto a snow wall sculpture that was constructed by Weisman and Johnson State students. 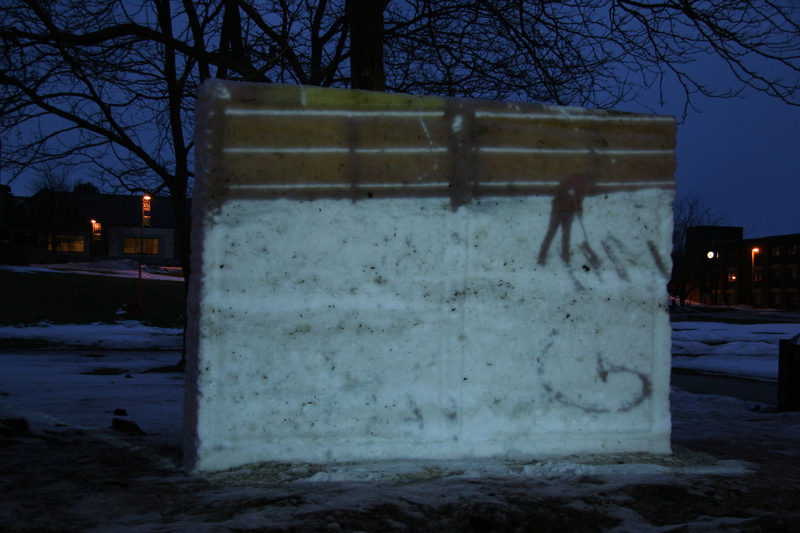 The snow wall also serves as a chronological monument that will gradually melt over time, thereby erasing the projection itself. Through out the exhibit the artist will continue to carve words into a gallery wall and then project back their recordings. Weisman uses the exhibition time and space itself to continue the dialogue of change and reflection. I personally experienced that My Human Being invited contemplation on how I feel about the passage of time, especially how I stand and move within it, and my responses to time when I am not actively engaged with it but am simply remembering. Ultimately what resonated with me most about this installation are my questions about how I feel and deal with ‘change’ itself.